I love listening to a record that I know nothing about. Doing this makes sure that my opinion is unaffected by what’s already been said about the record. Yeah, I like to think that I’m above being manipulated by critics, but it really is unavoidable sometimes. That hasn’t happened in this case, though. Earlier today, on one of my music forums, someone posted this album’s cover and name. Looking for something to listen to, I jumped without even glancing at the record’s description, or even the artist’s name. So now I know, for sure, that my love of EMA and her really weird fuzz-pop is all-natural. Honestly, I don’t think any amount of critical hate on this record could have kept me from enjoying it. When I write about how I want something out of the ordinary in my music, I’m talking about stuff like this. 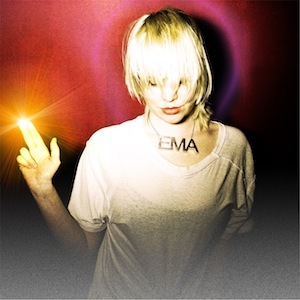 First of all, EMA can really sing. She’s got a beautiful voice, and isn’t afraid to show it off through layers and layers and layers. It’s what is going on all around her voice that makes this record so interesting, though. Other than the occasional decipherable guitar strum or piano chord, it’s really hard to tell exactly what EMA is using to make her music. All I know is that it involves a lot of feedback and danceable beats. I’ve done a little research now, and it appears that this record has received a lot of recognition, all of which is completely warranted. It’s inventive, but perhaps more importantly, catchy.